I was a chubby kid. My parents, though well intentioned, did not put nutrition at the forefront of our childhood meals and we ate an awful lot of t.v. dinners and food court meals. By the time I started university I was carrying an extra 20 lbs and was not happy with my general health. A year or two later I decided to try Weight Watchers and take up running. It was the perfect combo for me and I found a healthy weight for my frame and was fitter than I had probably ever been in my life. Fast forward to now. I’m a mom of two and I am tried. I try to get to my hot yoga classes at least 3-4 times and week and that means most of them are later in the evening and my dinner schedule is messed up. I default to easy. Cereal is easy. Toast is easy. You get the idea. I realized that I was basically consuming processed sugar at a rate that was almost staggering considering my general outlook on healthy living and eating. I knew I needed a change. So far I have lost 5 lbs and I feel great. It has been two weeks and I have yet to feel hungry and I have not eaten a single processed food. I have been cooking and baking far more than I had been which has been a huge benefit for the kids as well and my big kid has been begging for more of the brownies I made. If I can get a 7 year old boy to beg for a Paleo and vegan brownie, I feel like something is going right. Since they were such a hit, I have included the recipe below. 1)Preheat oven to 350° and line a 12 pocket muffin tin with parchment paper style liners. 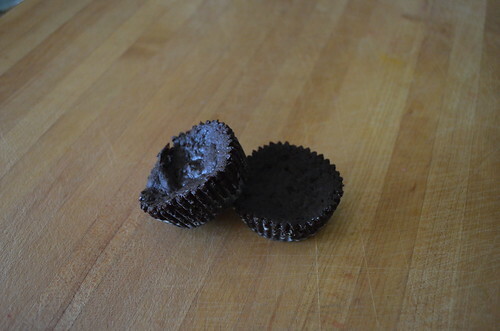 2)In a medium saucepan, combine coconut oil, cocoa powder, and unsweetened chocolate. Heat oven medium heat, whisking until mixture is smooth and no lumps remain. 3)Take off the heat and stir in the maple syrup or honey. The mixture should start to slightly thicken. 4)Add in the flax eggs and vanilla and mix well. 5)Add in the coconut flour, and salt. Stir until no dry pockets remain. 6)Pour into prepared pan and bake for 20-25 minutes. 7)Let cool in the pan and transfer to the freezer. They will firm up and this step is critical to their texture and consistency. If you want to eat them warm they will be more like lava cakes and who doesn't like those but for a brownie the freezer is needed. They will stay soft even fresh out of the freezer, have no fear! What else am I eating? I have been making amazing quinoa salads, muffins and breads using almond and coconut flour as well as treats like avocado pudding. I have also been eating a ton of fruit and veggies and I am also having one or two servings of beans on most days. I have committed to eating this way for 8 weeks. I will reassess at that point but I have a suspicion that I will try to eat this way 80% of the time and allow myself some leeway so that we can enjoy restaurant meals without having to ask for a ton of substitutions or changes since chefs tend to absolutely hate that! I feel like this is a diet (and I use that term loosely) that I can stick to without feeling deprived or struggle with. What type of special food plan or diet do you follow? Why do you think it works best for you? I try to eat healthy on a limited budget – that does mean beans and grains, but I love them, and wouldn’t give them up for anything. I love making breads and rice dishes and anything dairy luv. I like veggies, too, but don’t eat much meat or fish. I don’t eat a special diet. I love most meats but don’t eat them often, love fish, love my baked beans and eggs too. I eat bread, crumpets, crackers, cheese, drink coffee (very weak Nescafe), butter, fruit, salads – a bit of everything I suppose. Wow this sounds so delicious. I definitely want to try it. I did the same thing for 6-8 weeks starting in January due to food sensitivities. And I dropped 15 pounds in the first 3 weeks. It was crazy. I felt better too! Thank you for the recipe, I will have to try it. Thanks for the info,I definitely want to try it. I have a friend that is vegan and I don’t know how she does it. But Pegan doesn’t appeal to me at all. First let me say I could do vegetarian easily but I need eggs and cheese in my life, not to mention chocolate and desserts. For me, you only live once and I want to enjoy life not have to struggle and suffer more than I already do. I had to go gluten free over 8 years ago and I am allergic to pork and broccoli, along with being lactose intolerant. I believe I have developed further food allergies or intolerances and need testing. It is never easy, especially with a load of kids and a hubby with an iron stomach! I do love your recipes above!! I may as well go all the way to vegan paleo at this point! I try to incorporate various lifestyle diets into my daily living. These recipes look delicious. Sounds like something I should try. I would find it very hard as I love my sugar, but I think that is where most of my weight that i wish I didn’t have is coming from. I will be following your recipes and look forward to seeing more great recipes like this! I would love to try these, but I can’t have oils, so this diet makes food very limited. I can’t wait to make your special recipe, the Pegan (Paleo + Vegan) looks so delicious. I will be making this over the coming weekend. Two of my granddaughters have gone vegan and they seem healthy enough. I would probably go vegan if I lived alone. My husband would not want to miss his favorite dishes. Since we are seniors, I try to cook the dishes he likes. I eat lots of fruits and vegetables. Did I mention chocolate? I LOVE chocolate. Brownies are my favorite treat, so I will have to give these a try! I haven’t gone totally vegan because I love to many meat dishes but I do enjoy many recipes. 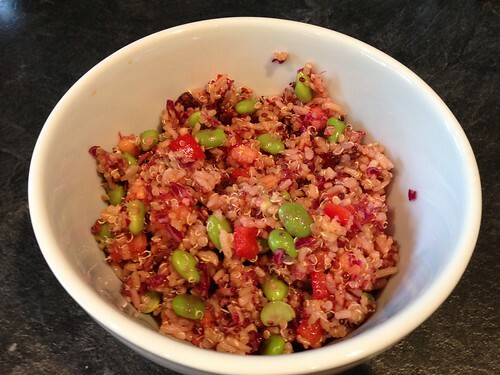 I’m always looking for new recipes to try and this one looks great, thanks for sharing it! Good recipe and tips. I’m doing low carb, high fat (keto). Nice to see some veggie paleo options. I admire your choice and self control. It takes allot of determination to achieve what you have. You make a very good case for you Pegan diet. I am trying to follow a food plan that uses more fruits, vegetables and grains. I am trying to have at least one day with no meat but have some other protein source. I am also walking more and doing yoga again. I hope this regime will help me lose a few pounds and firm up my body. We do not use a special food diet. I like to think we eat healthy and try to watch our portions and use common sense when it comes to unhealthy choices. This is interesting. I dont think I could give up dairy, but I would like to cut out meat. Great looking recipe I will have to try out soon. It sounds so healthy and I know it is something I should try but I am not a fan of vegetables at all so I don’t know how I would get my protein.